Desktop blogging tools like Windows Live Writer makes blogging easier but comment moderation requires user’s to login to their WordPress Dashboard for approving comments.There are adobe air applications like for moderating comments made on your blogs, but this requires Adobe Air RunTime installed on the machine. If you are looking for a desktop alternative for Windows/Unix (Linux) here’s wp-comments-notifier written in QT/C++ that alerts you when new comments are posted on your WordPress blog.Admin’s can manage/reply/edit your comments directly from your desktop. The application shows the total comment count, pending comment count and the spam comments count.Clicking on the comments give further options to approve/disapprove, reply, edit, mark as spam or delete the comment.The tray icon is A popup notifier is also available for new comments. 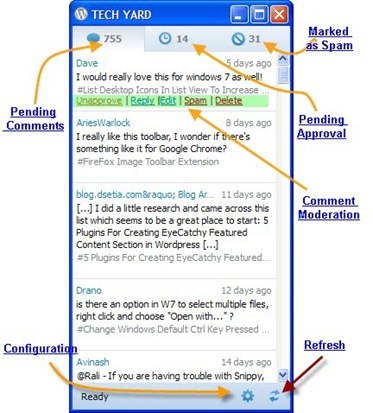 You can set the time interval between new comment checks from the wp-comments-notifier configuration window.If your receive lot of comments you can set it to a smaller number.To manually check for new comments click on the refresh button. Multiple blog support could be even useful for users with multiple blogs, nevertheless a good beginning for a complete desktop admin. If you are a Unix /Linux user you can also build it from the source which requires Qt 4.2 or higher. If you are a Linux or Mac User you can try the Adobe Air App – Moderator or you can build wp-comments-notifier from source on Linux.